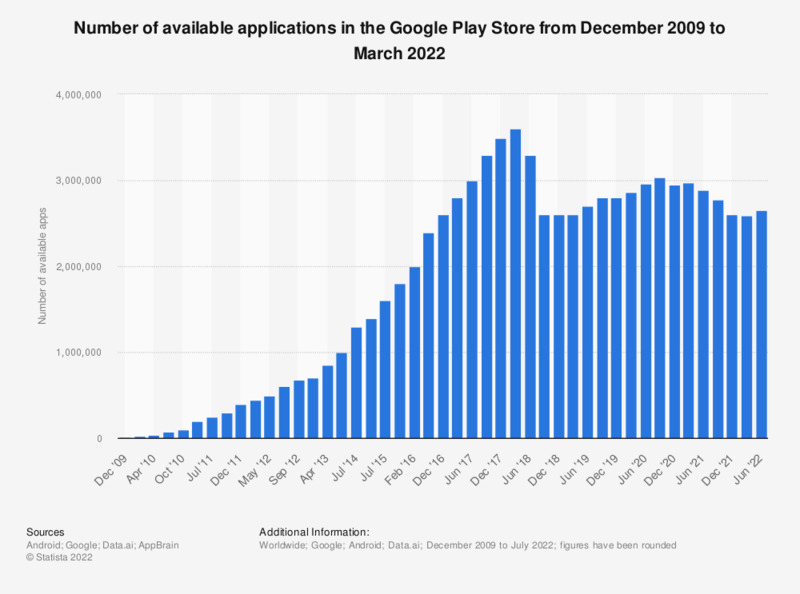 This statistic shows the number of available applications in the Google Play Store from December 2009 to March 2019. The number of available apps in the Google Play Store was most recently placed at 2.6 million apps, after surpassing 1 million apps in July 2013. Google Play was originally launched in October 2008 under the name Android Market. As Google’s official app store it offers its customers a range applications and digital media including music, magazines, books, film and TV. With the majority share of apps available from the Google Play Store being free of charge, the company needs to utilize effective business models to secure healthy revenue. As of July 2018, the top grossing Android apps worldwide included popular gaming apps such as Pokemon Go and the ever-popular Candy Crush Saga. Despite the robust gaming app revenues, the majority of gaming apps are free to download and rely on monetization via in-game purchases of items such as boosters and accessories. Google's June 2012 figures were announced at the company's I/O Conference on June 27, 2012. July 2013 data were from Google's Android and Chrome summer announcement in July 2013. In summer 2018, Google removed a large amount of apps from its Google Play platform, mostly due to an updated version of the company’s Developer Policy.